You are here: Home › Recaps › Articles › Drew's Blog › Did I just release a state record?!? 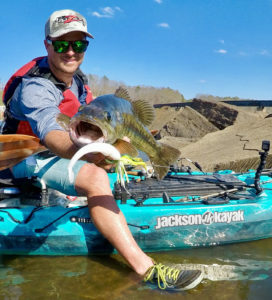 What would you do if you were in the middle of a river trip and you caught a new state record? 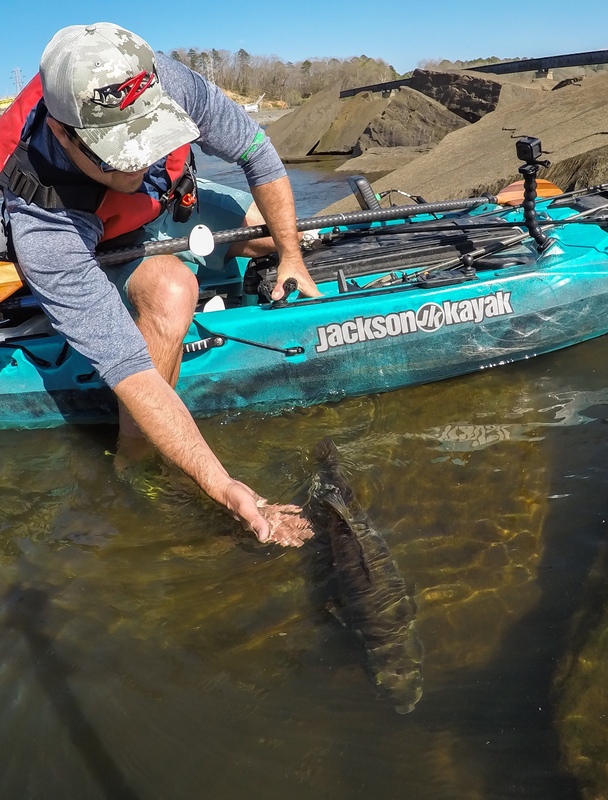 You see, in kayak fishing we go by length, not weight, so it’s not really important for me to carry a scale on each trip. However, on a recent trip earlier this spring I wish I had one! 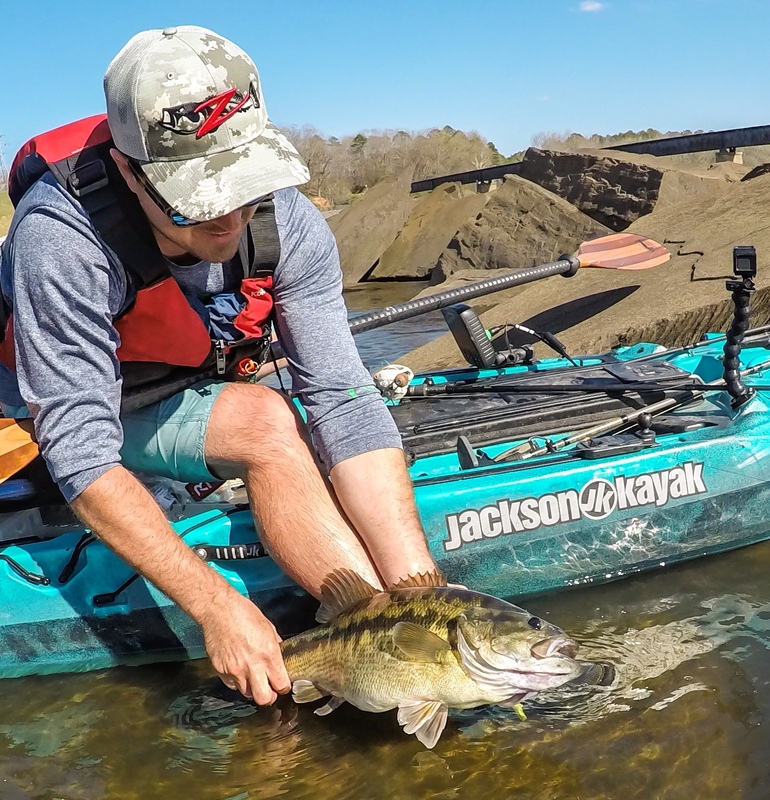 I also wish I had taken a glance at the NC record for spotted bass, which is technically now called the Alabama Bass. 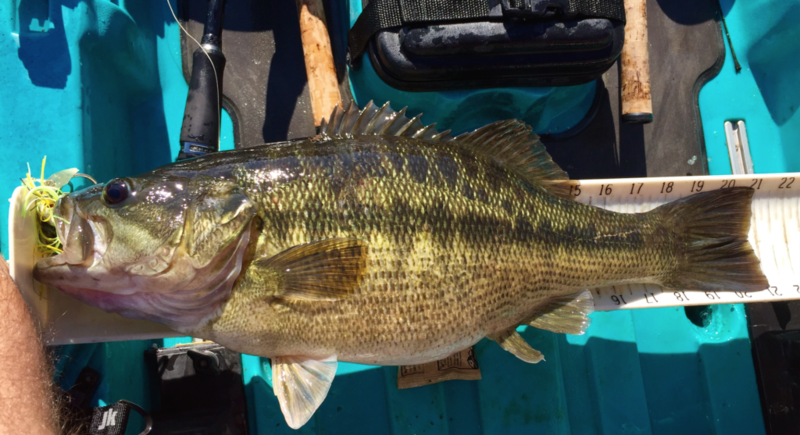 The record is only 6lbs 5oz, mainly because they aren’t native to NC so they aren’t in as many lakes/rivers. However, some people think they are doing a good thing by moving them to new river systems, where they don’t belong. I had never caught one in this area of this river before, and I was shocked at the size of the one I caught. I caught her on March 10th, when the water temp was in the mid 50’s. I was finding fish anywhere from 3ft to 8ft of water. Since they were in heavy pre-spawn mode I had some big baits on, including the 1/2oz Z-MAN Chatterbait with a 6-inch Swimmerz as a trailer. I feel this sort of gives me both a chatterbait bite and a swimbait bite at the same time. Behind a large flat rock outcropping the water was about 3 ft; this is where she bit! You can tell it was calm and probably a little warmer in that area. I suspect she might have been scoping out that large, flat protected spot as a potential spawning area. 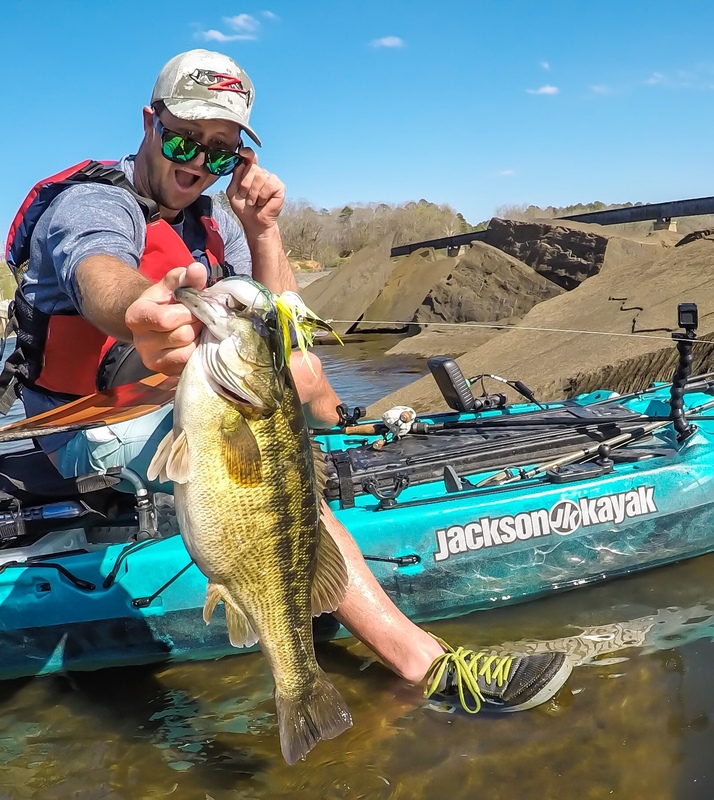 She nailed the bait and put up the fight you’d expect an Alabama (spotted) bass to put up, especially one that lives in the river! What surprised me about this fish is how big and heavy her mouth looked, and how fat she was. I’ve seen 21 inch largemouth weight 8lbs plus so you never know. 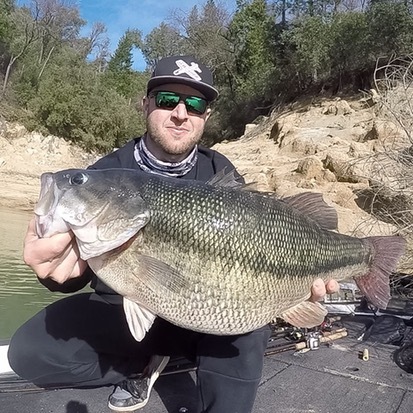 Obviously this fish was not a largemouth, but I figured there was a chance, given how fat she was and how big her head was, that she weighed over the 6lbs 5oz state record. Of course, at the time, I had no idea what the record was so I just measured her, took some cool GoPro photos and released her. It got me thinking though, what would you do if you caught a record on the river? Would you end your trip and call the state agency and have them meet you at the take out? She might die if kept on a stringer that long due to stress. Is it worth killing the fish? Would you have been more prepared and had a scale pre-certified by the IGFA and have some witnesses with you? 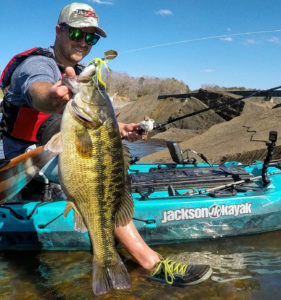 You could get on the bank to weigh it and video the entire thing, which is what happened when the world record was recently broken for spotted (Alabama) bass. It looks like the new WR will be 11lbs 4oz and it was 24inches long! One of those trout fed California Alabama bass. Before I even knew I had a potential record I was telling my friends about the fish and guestimating it around 6-7lbs. I guess now I’ll never know, but I do know that a record like that would be something very cool to have in your name (until it gets broken again), but in reality it’s just as cool to me to have my photos and watch her swim away to get even bigger. 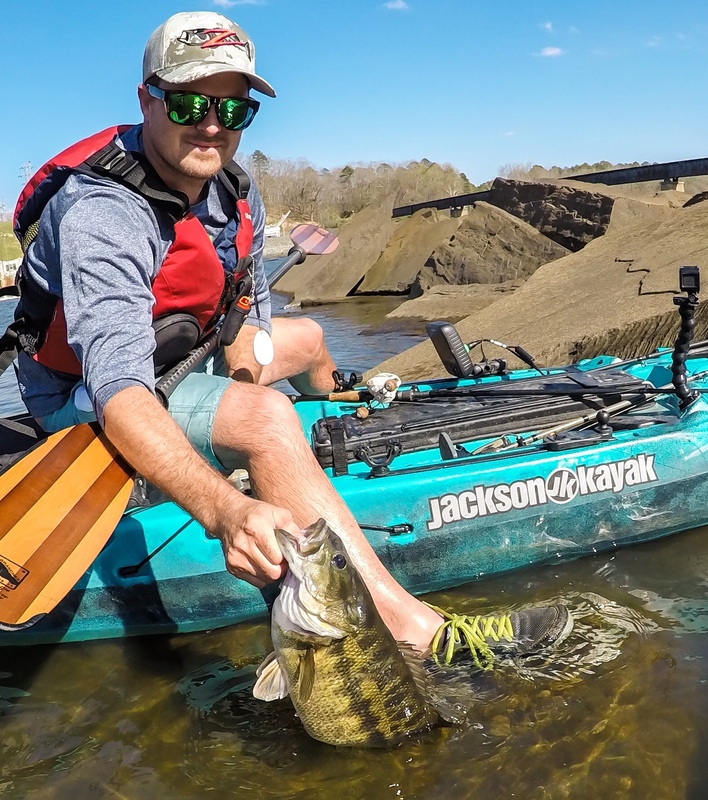 For those who care to know, this fish was caught in water that is in bounds for the upcoming River Bassin’ Tournament based out of Rock Hill, SC, on April 29th, so hopefully with all those talented anglers we’ll see another one like this show herself at that event! Either way, I can’t wait to see everyone out there having a blast as always! Line: 30lb Hi-Seas braided line, moss green. Anchoring system: Both Power-Pole Micro Anchor & Anchor Wizard were used.